This State Park, accessible only by boat, offers visitors fishing, hiking trails, picnicking and tours of the recreated Blackistone Lighthouse. Visitors to the St. Clement’s Island Museum can take a water taxi to St. Clement’s Island State Park where the State’s colonial history began. Visit the site of Maryland’s birthplace. In 1634, English settlers landed here to establish a colony of religious freedom. Enjoy a hike around the 40 acre island, a relaxing picnic at the pavilion, and scenic views of the Potomac River. The Island also features the newly reconstructed Blackistone Lighthouse. Educational panels provide island history. St. Clements Island Museum is located nearby on the main shore. Pier and docking facilities are available. A seasonal water taxi to the island runs on select weekends from the museum. The Greenwell Foundation, Inc. is a nonprofit organization that works in partnership with the Maryland Park Service at Greenwell State Park to provide accessible and inclusive programs such as therapeutic and recreational riding lessons. Greenwell offers nearly 600 acres, 10 miles of trails, and 2 miles of waterfront along the Patuxent with an accessible 50 foot pier. Kayak/canoe launch sites, beach and picnic areas throughout. Wheelchair accessible facilities include the Pavilion and Knott Lodge (an overnight facility for up to 16 guests). Historic Rosedale Manor, the Chapel and gardens can be reserved for weddings and special events. Horseback riding programs, summer camps and special events are offered. Built in 1884, the Queen Anne style house at Summerseat Farm Summerseat Farm is surrounded by mature gardens. The goats at Summerseat Farm are just as curious about you as you are about them. With a history dating back to the late 17th century, Summerseat is a 120-acre working farm with a Queen-Anne style house, outbuildings including meat and dairy houses, barns and gardens. Summerseat breeds the only publicly accessible herd of American Buffalo in the region. The farm has other animals, a vineyard and trails including a Bluebird trail. Tables and a gazebo are available for picnickers. Check the website for special programs, events, and facilities rental information. Scenic view of Potomac River, a playground, picnic areas, ball fields, tennis courts, basketball court and fishing pier. Open seasonally. 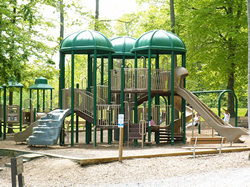 Within this scenic wooded parkland are hiking and nature trails, picnic areas (grills and tables), picnic pavilions, playground areas, fishing piers, and a boat ramp (electric motors only, please). 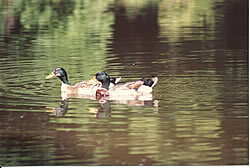 The main attraction is a 60 acre fresh water lake which affords fishing, pedal boating, rowboating and canoeing. Fishermen are able to catch bass, bluegill, trout and catfish. Fishing supplies, fishing licenses and concessions are available. Gilbert Run Park is located 8 miles east of La Plata on Route 6. Rustic cabins on Chesapeake Bayfront. Swim, fish, crab, fossil hunt, picnic and birdwatch. Sandy beach. Fossil hunting year round. Built in the early 1880s, the school is the oldest standing one-room schoolhouse for African American students in Calvert County. Offering education for grades 1 through 7, it was built in the early 1880s and remained in use until 1934. Located on the grounds of Calvert Elementary School.